One of my favourite lunchtime places in the CBD is Famish’d. I’m not really a salad lover in general, although I have been converted to the cause as I have grown older and wiser (and discovered Yumm dressings, I’m not affiliated with them in any way but if you see them at a farmer’s market or independent grocer snap the original flavour up, it makes any salad divine! I have tried to recreate this dressing at home but failed miserably) but I make an exception for these salads as a recovering carboholic. Guerrilla shot from iphone of my salad being prepared, please excuse blurriness. The salads are expensive for a work lunch ($11 large + more if you add extra things) so I tend to treat myself only occasionally. How sad is it that I “treat” myself with healthy food? But I’m a massive stinge when it comes to work lunches, although we stingy people prefer the term “frugal”. For a while last year when I discovered that my work supplied peanut butter to staff, and a fruit box came twice a week in which I could liberate a bunch of bananas – this was back when they were reasonably priced, you understand, I was bringing two slices of bread from home and constructing peanut butter and banana sandwiches for lunch for a total cost to myself of approximately 40c. And I was proud of it. PS If you want to go down this path, you need to use crunchy peanut butter, because the banana is smooth and mushy, and smooth peanut butter (which should be cast off the earth in my opinion, although others beg to differ) does not provide enough of a textural contrast – your sandwich will end up sticking to the roof of your mouth. But I digress. Back to Famish’d – I’ve only ever tried the pre-made salads, which you can eat in your giant bowl in-store or take-away in a cardboard box for consumption at your desk *sigh*. They usually seem to be vegetarian, and have always been fresh and delicious. You can make your own, too, with any combination of ingredients you want. Curried potato, mushroom madness, and excellent eggplant (under the bread). Sorry about the wallet being in the picture, blogger fail. The staff are all exceedingly cheerful, even when dealing with the hungry lunchtime corporate plunderers. Plus, they cater to carboholics like me by giving a slice of grainy, seeded bread or sourdough with my salad, or the option of a baked potato or sweet potato with toppings instead of a salad. Win. I’ve also heard good things about their sweet stuff but never purchased myself but on a recent occasion, I went just for coffee (it’s St Ali coffee). Famish’d is one of those adorable places that give you a free sweet thing with your coffee, and delicious mini chocolate meringues were on offer. Yum! Other blog reviews on Famish’d have been equally positive: Nouveau Potato shared her take and found the salads filling and healthy; Sweet and Sour Fork loved the gargantuan servings as did Eat and Be Merry For Tomorrow We Diet; Let Me Feed You thinks it’s brilliant for work lunches. 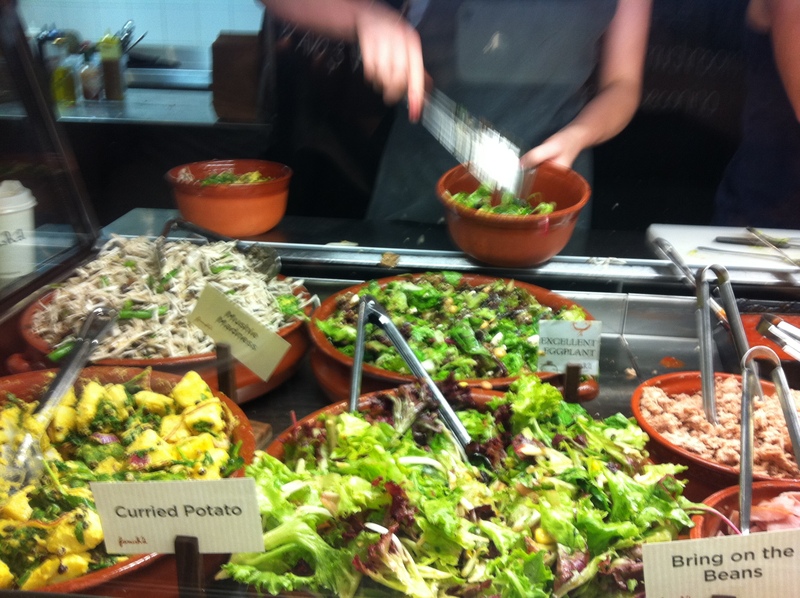 Tags: cafe, coffee, healthy, melbourne cbd, review, salad, work lunch. Bookmark the permalink.